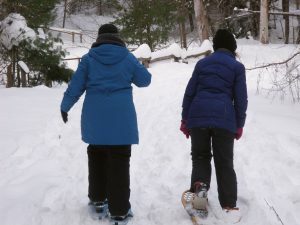 The Amboy 4-H Environmental Education Center will continue its Sunday Woodland Snowshoe Wanders programs into February, including Sundays, January 29 and February 5 and 12, at 2 p.m.
Everyone age three to 103 can easily learn to snowshoe. Participants from last winter’s Woodland Snowshoe Wander head out on the trail. There is a program fee of just $4 per person or $12 per family and children under three are free. During the Woodland Snowshoe Wanders, an environmental educator will give a brief instructional lesson on snowshoe technique and then lead participants for a short wander through the center’s mixed woods and wetlands. Participants are encouraged to dress warmly and in layers. Outdoor footwear or winter boots that can be strapped into a snowshoe should be worn. Sneakers and fashion boots with heels do not fit in the straps and will make walking very difficult. Amboy 4-H Environmental Educational Center is located on State Route 183, between routes 13 and 69 in eastern Oswego County. For information about the facility and its programming, call the Cornell Cooperative Extension of Oswego County 4-H Office at 315 963 7286.